More than 140 artists from around the region will display their wares in Coeur d’Alene at this weekend’s Art on the Green. • Parking: The city has a new, large, free parking lot just north of City Park along Northwest Boulevard. Look for the signs. Also find free parking south of City Hall at Eighth Street and Mullan Avenue. • Shuttle: A free shuttle bus stops every 20 minutes at the North Idaho College Student Union, Memorial Field, and Sherman Avenue at Third and Fourth streets. 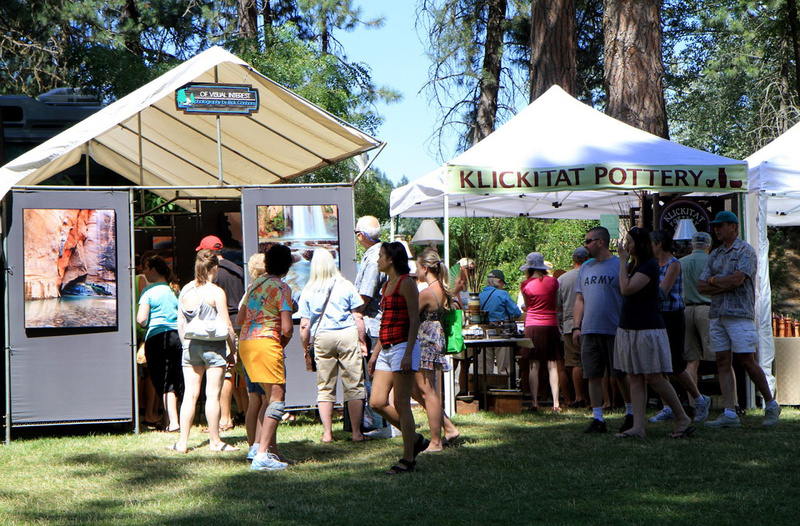 If you enjoy browsing art and craft booths, have a healthy appetite and don’t mind summer crowds, Coeur d’Alene is your destination this weekend. Call it the mouthful festival – Art on the Green/Taste of Coeur d’Alene/Downtown Street Fair – a congregation of food vendors, artists and musicians spread across a mile and a half of Lake Coeur d’Alene’s north shore. The fun starts today and continues Saturday and Sunday. More than 140 top artists from the region display and sell handcrafted works in glass, clay, leather, wood, metal and fiber. Plus live music on two stages, art activities for kids, children’s poetry, food booths and a wine and beer garden. Posthumous booth: Perennial exhibitor Dennis Young, a well-known architect and potter, died last December. The booth remembers Young and his pottery. Proceeds will go to the Forever Young fund. Juried show: Prize money totaling $3,300 will be awarded for works including paintings, photos and three-dimensional items. Clothesline sale: This community booth showcases original works by local artists. Prices range from $10 to $75. Entertainment: More than 30 performances of music, dance and entertainment over three days. Jazz, pop, country, world music and more. From cheesesteaks to funnel cakes, about 20 food vendors do their thing. Scores of craft vendors sell their works, and live music fills the park. Crafts: More than 70 vendors offer handmade crafts at moderate prices. Includes jewelry, furniture, photography, metal work, sculpture, textiles, soap and candle. For kids: Children can escape to merry Old England for knighting ceremonies and step into a fairy garden and help invent fables courtesy of the Spokane Entertainers Guild, which hosts the Spokane Renaissance Faire. Music: Country, rock, folk, blues and bluegrass are among the musical styles slated for the band shell. This is where downtown merchants shine, and more than 60 take part – along with more than 170 from elsewhere – as six blocks are closed to vehicles to make way for retail and food booths. Music: South American folk, pop and piano at Third and Fourth streets.